How do I run derv_appserver.py from within my feature file in behave python? 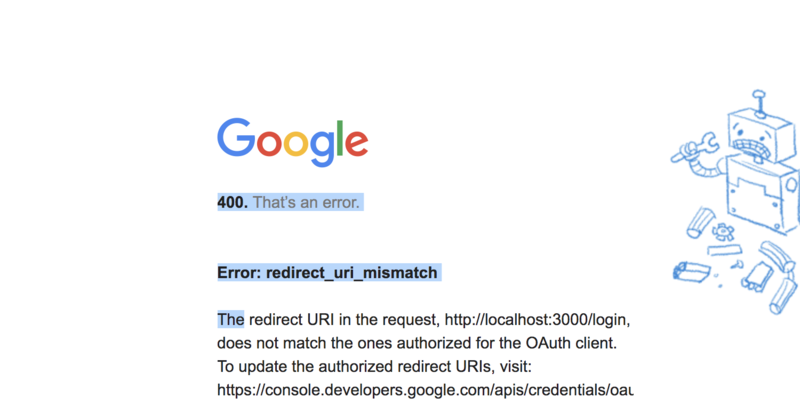 what Redirect_uri should be defined in developers console in case of ux_mode="redirect"
How to resolve the error http500: "Internal error encountered"
I have a python app I want to deploy on App Engine (2nd Generation Python 3.7) on which I use a Service Account with Domain-wide delegation enabled to access user data. This works good and, as far as I know it is the current way to do this when using Application Default Credentials (locally I have GOOGLE_APPLICATION_CREDENTIALS defined). I have enabled Domain-wide delegation on the GAE service account already. What is different between the GOOGLE_APPLICATION_CREDENTIALS I use locally and the ones in GAE when both are service accounts with domain-wide delegation? Where is .with_subject() on GAE? The creds object received is of type compute_engine.credentials.Credentials. AttributeError: 'Credentials' object has no attribute 'with_subject'"
Instead of manually specifying the scopes here, you must configure your Compute Engine instance to allow access to the necessary scopes. I have nothing that uses this in my application. I am having an issue using jUnit tests and handling exceptions in Java. I created my TestClass with both the annotations @RunWith(DevAppServerTestRunner.class) and @DevAppServerTest(TestConfig.class) since I need to test a method that use some properties configured in my appengine-web.xml file. The problem comes when, after declaring a jUnit @Rule to define an Exception I want to test, I ran the test and got an error saying "The Rule 'myexceptionName' must implement MethodRule or TestRule". That's pretty strange since the exception I declared is of type ExpectedException, a jUnit class that already implements TestRule. I suspect this issue has something to do with my @RunWith and @DevAppServerTest annotations because using another class without them, the Rule implementation works(solution I can't use since I need to read some properties from appengine-web.xml). Did anyone encounter something similar or have a clue on how to deal with this? org.junit.internal.runners.rules.ValidationError: The @Rule 'exc' must implement MethodRule or TestRule. dev_appserver.py starts a local deployement of my appengine service. I want to run my tests on behave on this local service. I want to start the server within my tests first. How to run the dev_appsrrver.py app.yaml command in my behave feature file in the start ? I have tried subprocess.run("python","dev_appserver.py") but it says couldnt find the file dev_appserver.py. I'm trying on windows. The response is null. Any idea? I am currently writing a python script to pull information from YouTube Analytics API for a list of separate YouTube channels. The output would be, for example, count video views for each YouTube channel in last month. My initial idea was to ask each of the YouTube account owners to create a YouTube Analytics app in their console.cloud.google, create a Project, enable the youTube Analytics API, generate an API key and specify that it is needed for the YouTube Analytics API. it fails with a HttpError 401 Request is missing required authentication credential. Expected OAuth 2 access token, login cookie or other valid authentication credential. See https://developers.google.com/identity/sign-in/web/devconsole-project. I am not sure if I have done something wrong in creating the API key, or if instead the YouTube Analytics API requires Oauth2 authentication. If the latter is the case, then I am surprised that google console lets you to go all the way and generate API keys and specify that they are needed for the YouTube Analytics API, only for you to find out that you can't use it. So my question is: do I have to use Oauth2 for YouTube Analytics API or can I use the API key? I'm trying to read data from "my own" account, so why do I need to manually authorise my own app? i'm trying to apply the code that i got from https://developers.google.com/sheets/api/quickstart/python and when i try to modified the method copyto to suit my link , it did not work. i've tried re-download credentials.json, create a new doc and new python file, and nothing works. # If modifying these scopes, delete the file token.pickle. # The ID and range of a sample spreadsheet. # If there are no (valid) credentials available, let the user log in. # The ID of the spreadsheet containing the sheet to copy. spreadsheet_id = SAMPLE_SPREADSHEET_ID  # TODO: Update placeholder value. # The ID of the sheet to copy. sheet_id = 0  # TODO: Update placeholder value. # The ID of the spreadsheet to copy the sheet to. 'destination_spreadsheet_id': SAMPLE_SPREADSHEET_ID,  # TODO: Update placeholder value. # TODO: Add desired entries to the request body. I need to get the list of all files and folders in google drive owned by a user. For some reasons file.list method doesn't return nextPageToken in response and I see only few results, since I can't go to the next page. I have tried API Client Library for python and API explorer, but I receive only several records per user. I am getting back user usage data from the Google Admin Report User Usage Api via the Python SDK on Databricks. The data size is around 100 000 records per day which I do a night via a batch process. The api returns a max page size of 1000 so I call it 1000 roughly to get the data I need for the day. This is working fine. My ultimate aim is to store the data in its raw format in a data lake (Azure Gen2, but irrelevant to this question). Later on, I will transform the data using Databricks into an aggregated reporting model and put PowerBI on top of it to track Google App usage over time. As a C# programmer, I am new to Python and Spark: my current approach is to request the first page of 1000 records from the api and then write it to the datalake directly as a JSON file, then get the next pageset and write that too. The folder structure would be something like "\raw\googleuser\YYYY\MM\DD\data1.json". I would like to keep data in it's rawest form possible in the raw zone and not apply too many transformations. The 2nd process can extract the fields I need, tag it with metadata and write it back as Parquet ready for consumption by function. This is why I am thinking of writing it as JSON. This means that the 2nd process needs to read the JSON into a dataframe where I can transform it and write it as parquet (this part is also straight forward). Because I am using the Google Api I am not working with Json - it returns dict objects (with complex nesting). I can extract it as a Json string using json.dump() but I cannot figure out how to write a STRING directly to my datalake. Once I get it into a dataframe I can easily write it in any format, however it seems like a performance overhead to convert it from Json into a dataframe and then essentially back to Json just to write it. Build up a list of pyspark.sql.Rows and at the end of all the paging (100k of rows) - use spark.createDataFrame(rows) to turn it into a dataframe. Once it is a dataframe then I can save it as a Json file. This works, but seems inefficient. Then I get the next 1000 records and keep doing this. I cannot seem to use the open() method directory to the data lake store (Azure abfss driver) or this would be a decent solution. It seems fragile and strange to dump it locally first and then move it. Ignore the rule of dumping raw Json. Massage the data into the simplest format I want and get rid of all extra data I don't need. This would result in a much smaller footprint and then Option 1 or 3 above would be followed. (This is the second question - the principle of saving all data from the Api in it's raw format so that as requirements change over time I always have the historical data in the data lake and can just change the transformation routines to extract different metrics out of it. Hence I am reluctant to drop any data at this stage.